The children asked during the activities of the Children’s Forest Program. It was at the time that primary school pupils and junior high school students learned planting and subsequent management in September 2009. On that day, the children sowed about 1,000 Albasiah and about 500 acacia seeds. Previously, OISCA provided seedlings for tree plantings. It was the first experience for the children to grow trees from seeds. For about next 3 months, the children watered and took care of them until the seedlings have 5-6 leaves. After 3 months, the seedlings grew enough to be transplanted. The children were very delighted at the growth and carefully planted around the school. The children brought the remaining seedlings to their home and their parents planted them in the garden or nearby vacant land. The children made a promise to keep taking care of these plants. 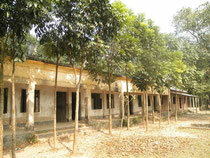 Bagbari Madrasa is a school comprising approximately 600 students both primary and secondary school combined. In this school, students know each other very well and everyone is like a family to all. 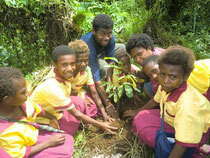 SInce they started to join the Children’s Forest Program, the students took care of planted tree seriously. Due to their efforts, the school has included environment-related topics in extra-curricular activities. Now the trees provide the school and the children cool wind and a shade from direct sunlight. From this year, the school has started agriculture and environmental education. But since the school has no enough facility for the children’s practical and hands on exercise on basic agriculture, OISCA Bangladesh and Bagbari Madrasa primary and high school agreed that practical sessions be conducted at OISCA’s training center. Hopefully, this interaction will mark a new beginning of "give and take" between the children and agriculture, as well as between the school and the Children’s Forest Program. During the dry season, drought persists and the land dries up, and during the rainy season, floods occur frequently due to continuous rainfalls. In Surin Province located in the northeast region considered to be the poorest in Thailand, farmers are suffering from this severe climate. In this land, making a forest and fundamentally changing the soil and climate is very important, at the same time, is a difficult task. The survival rate of seedlings is low and trees grow slowly. Patience and efforts are required. Nadeevittaya School started the Children’s Forest Program in 1998. At the time, there were few trees and little shade. But in the subsequent 12 years, its efforts have been recognized, and received many awards. For example, they received the award for tree planting activities in 1998 and in next year they got the second prize in the “contest for tree planting and management of tree planting sites in education". In 2001, the school was selected as a school conducting excellent education in Surin Province. The dry land has now become covered with tree shade. In the forest near the school, villagers are seen looking for mushrooms. They harvest herbs from the planted trees and used them for cooking. This is also one of the achievements by the past activities under the Children’s Forest Program. The students at Gonadika Elementary and Junior High School thought of the idea. However, no budget is found. Then the children suggested picking and selling bananas which they planted two years ago to raise the needed budget. They sold bananas for 8 months at the plaza near the school and they afford to buy nets. For making net house they needed steel pipes, but supplemented with plastic pipes and finally managed to complete a small net house. Now, seedlings named Ericanut grow in the net house. 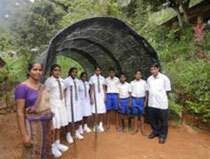 In this school, children from the two opposing races,Tamils and Sinhalese, are learning. It is said that there is less discrimination than before. The school principal said that by working for a greater common goal through the Children’s Forest Program, the children might have changed. On the wall of the school, a picture with the theme of “All brothers” is painted, and is watching the children. Rieit Elementary School is located at the foot of Mt. Sinivit (2,438m), the highest mountain in East Britain Province. This region were covered with dense forested before. But in the 1970s, the land in the area was sold to the people who came from the towns or the main island, and most of the land was converted to cacao plantations. And now, many villagers lament the disappearance of the forest. Today, it is impossible to observe big birds called Hornbills, once normally seen. The storong wish for the birds return motivated teachers and children to join OISCA’s CFP. This conversation carried out between the children and the CFP coordinators whenever they plant trees. Nowadays, The new gold mine has been developed gold in the areas close to the school, and the deforestation has been continued. 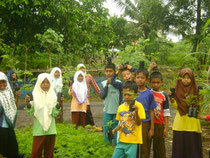 We promote Children’s Forest Program to involve more children and local residents and protect the forest with them. 【Philippines】We beat water shortage ! From 2009 through 2010, Mindanao Island suffered a severe water shortage due to the continued drought. The island depends on hydro electric power, but due to the low lake water level the power stations could not generate sufficient electric power. Power failure during 8-hours a day continued for several months. It is said that the drought which seriously affected the life of the local residents and agricultural production is due to the abnormal weather caused by the El Nino effect. In spite of this serious situation, thanks to the school forest the well water did not dry up around the school taking part in the Children’s Forest Program since 1994. Every mornig, the children sweep fallen leaves and clean the well first when they come school. During the break time, many children gather around the well and drink water. Through the water shortage, the children learned firsthand the relations between water and trees and also the importance of reforestation. Although it was challenging time, it might be a good opportunity to learn about the natural mechanism. Bingkor Junior High School is located in the central part of the Keningau district of the Sabah inland area.The school is participating in the Children’s Forest Program (CFP) since April 2010. 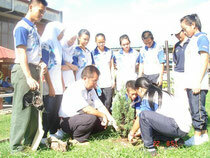 On April 22, the Earth Day, SMK Bingkor, jointly with OISCA, carried out tree planting activities. The school has originally promoted environment conservation activities, and has Nature lovers’ club as one of the extracurricular activities. Regarding this tree planting activity, the members of the Nature lovers’ club took the lead in making preparations, and school teachers, children and the CFP coordinator took part. The children are responsible for watering the planted seedlings every day, and are looking forward to seeing the subsequent growth. Before the construction of the school, there was a forest with rich ecosystem in this place. For this reason, the school would like to continue afforestation activities in cooperation with the local residents so as to restore the environment a little close to its original state. Nakorotubu School is located on the beach of Ra district in the northeastern part of Viti Levu Island.Some 120 children are learning under 5 teachers. OISCA is taking part in the mangrove planting activities carried out in this district. In this area, after the mangrove trees were cut down, fish number has been decreased, and there has been damage of coastal erosion. 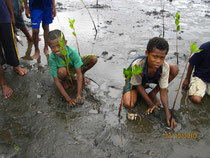 In 2010, the children and their parents planted about 5,000 mangrove trees along the coast. Moreover, due to the influence of rise in sea level by the climate change and felling of the upstream forests, the near-by river has floods when there are big rainfalls. The school is also affected by the floods. In order to learn about these problems, the school is conducting work shops involving the community residents. Also, in the recent years, there has been increasing awareness towards garbage problem and recycling in Fuji, and so, the 3R (Reduce, Reuse, Recycle) outreach activities are being carried out. The children who learned that the desert land nowadays had once been rich in green glasses, were strongly encouraged with hope of being able to restore green in this land. The left side photo depicts a scene from the “fire festival” of the Mongolian tribe. 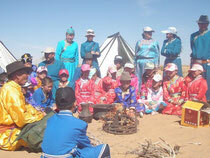 On this day, the children went to the desert with the monks, learned how to use fire, listened old tales and talks about environment by the OISCA staff. They spent a memorable day. With the recent economic growth of China, there has been an increasing awareness for environmental protection in the Inner Mongolian region, too. It is a big change that there are now requests from school teachers for environment education programs. OISCA intends to strive for responding to these requests.